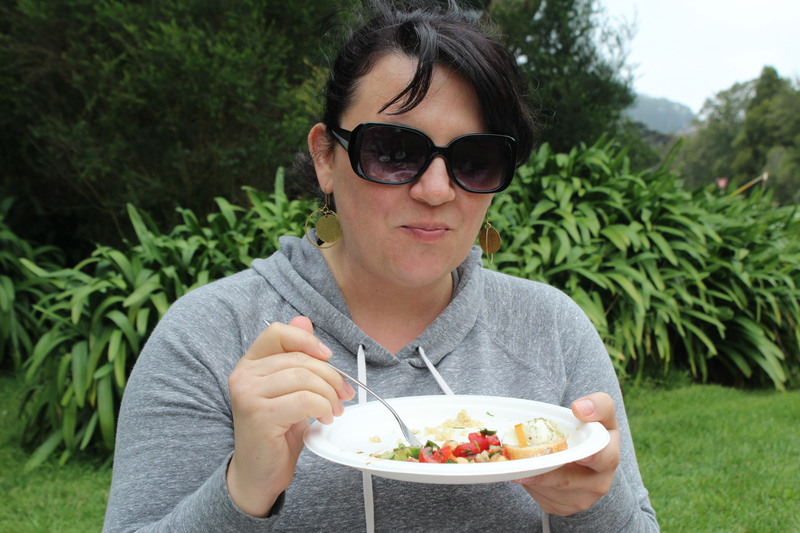 Jacque was in the Bay for a brief stint, so we busted out our knives and aprons and threw together our first-ever M&D picnic. That was the smart part. The location was a little bit less thought out. We set our sights on the Dahlia Garden in San Francisco’s Golden Gate Park, a destination Jaime’s had my eyes on ever since her daughter, Dahlia, was born. But what her Oakland-self forgot was this – on a cloudy day, Golden Gate Park is freezing. Like, really, really cold. So we fought the wind and laid down our blankets in a hurry, and we got started quick. The weather may not have been ideal, but I can tell you this – the meal was perfect. P.S. Looking for other M & D picnic combinations? Try our Beet Burrata & Lentil Salad, Buttery Hummus with Za’atar, Cucumber Poppy Salad, and Marinated Peaches. 1 preserved lemon (rind only), cut into 1 inch slivers. 1. Slice baguette into 1/4-inch thick rounds. 3. Finish each with a sliver of preserved lemon, a sprinkle of za’atar, and a tiny bit of sea salt. 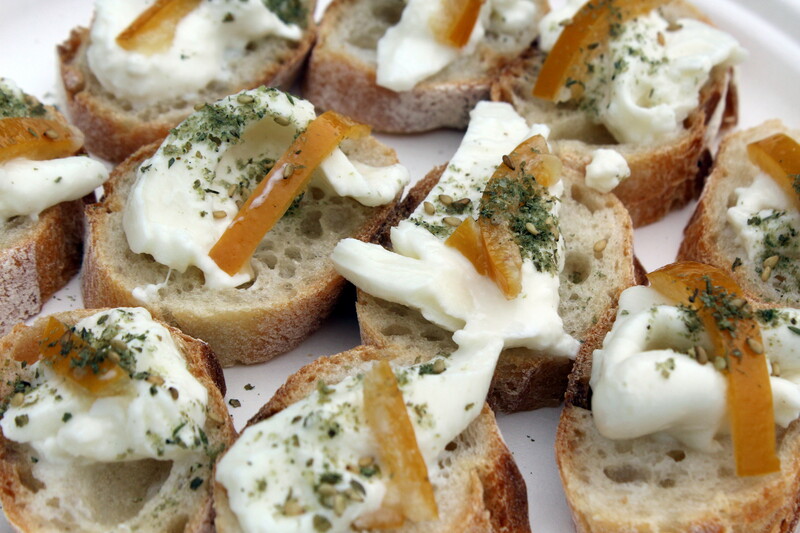 **M&D picnic tip: Preserve the bread’s crunch and the burrata’s creaminess by assembling the components of these crostini on site. 1. Wash and cook quinoa according to instructions. I use a 1 cup quinoa to 2 cups of water ratio with a pinch of salt. Allow to cool. 2. Snap ends off of snowpeas and cut into 1/4 inch pieces. 3. Slice radishes and green onions. Mix with snowpeas. 4. Add chopped dill to vegetable mixture and incorporate throughout. 5. 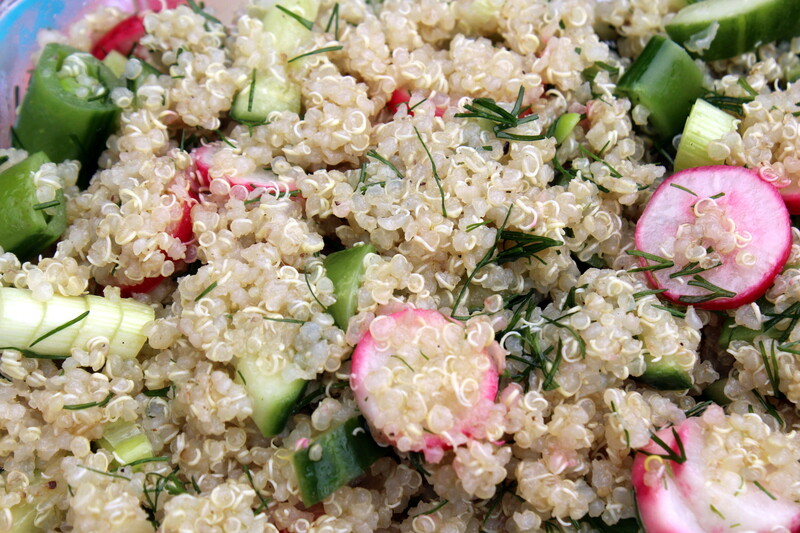 Once quinoa is cool, add to vegetable mixture as well. 6. 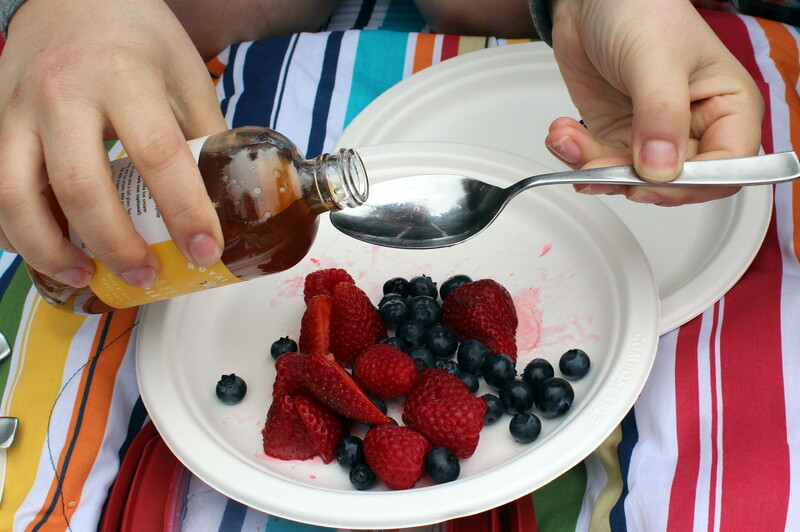 Make a quick vinaigrette with olive oil, champagne vinegar, lemon juice, salt and pepper. 7. Add dressing to salad and mix well. 8. Keep cool in refrigerator. Serve chilled or at room temperature. 1. Cut and combine cucumber through onion in a large bowl. 2. 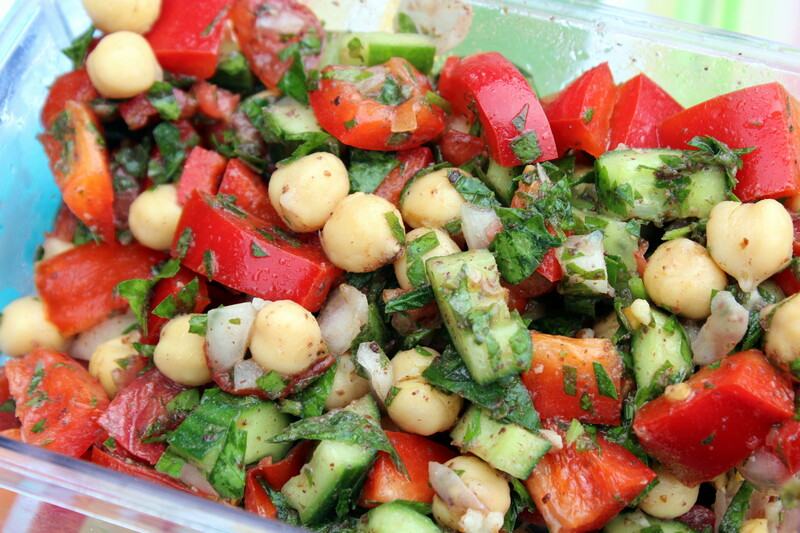 Add chickpeas, chopped herbs, and sumac to the bowl of vegetables. 3. Combine last 4 ingredients in a separate bowl or measuring cup to make the dressing. Taste and adjust seasoning to your liking. 4. Add to the salad and toss until fully coated. 1. 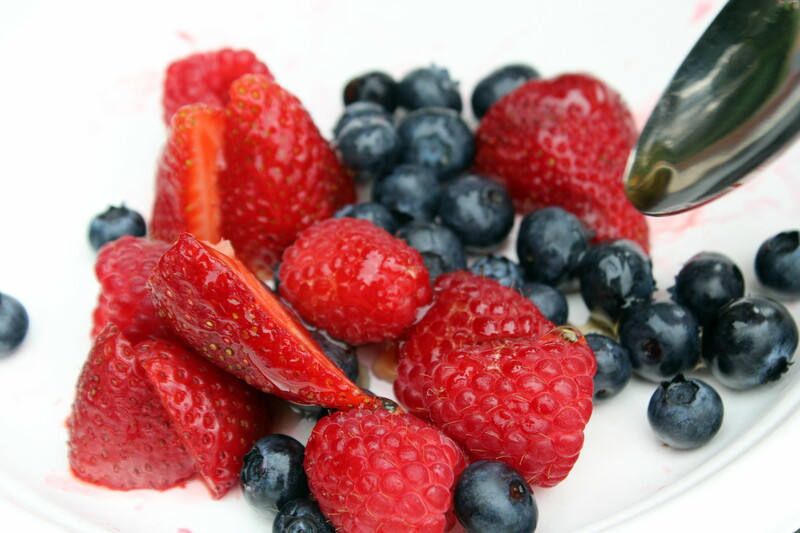 Rinse and wash berries and place them in a tupperware or bowl. 2. Add in syrup and toss to combine. Easy peasy! Photographic evidence that the wind was fierce! This entry was posted on August 21, 2014 by mezzeanddolce in Appetizers/Dips, Dolce, Fruit, Grains, Mezze, Salads, Side Dishes and tagged blueberry, burrata, champagne vinegar, chickpea, cucumber, dill, mint, parsley, pea, preserved lemon, quinoa, radish, raspberry, red pepper, strawberry, sumac, tomato, zaatar.